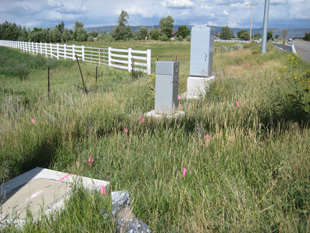 SUE Solutions successfully completed the Quality Level ‘B’ utility designating services for the SR-189; Charleston to Heber City project located in Heber City, Utah, for UDOT Region Three. The general scope of the planned roadway widening reconstruction project includes widening and partial reconstruction of the SR-139 corridor between Daniels Road and SR-113. SUE Solution’s Scope of Work included Quality Level ‘B’ designating (horizontal) locating services. 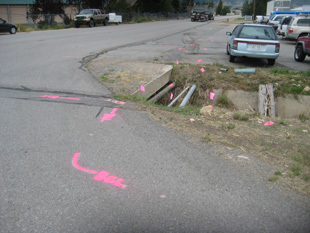 The utility designating services were completed in September of 2010. Approximately 66,400 feet of Level ‘B’ designated utilities were located, surveyed, and mapped throughout the project corridor, with an additional 7,000 feet of utilities mapped under Quality Level ‘D’ specifications. Utility coordination efforts with Heber City, existing utility owners, and local utility locating contractors also took place to account for those utilities that were not locatable by conventional means. This project was delivered ahead of schedule, in order to meet project deadlines. A comprehensive final SUE report was produced as a deliverable which contained utility (QL-B) mapping exhibits, CAD files, photographic documentation, informational data sheets for the sewer and storm drain systems, survey data, and Utility Owners existing mapping.